Sermon: Acts – Who’s The Governor? Ted Robbins by Thwaites Empire Theatre on Flickr. Copyright Mike Johnson Mikeseye Photographic. Some rights reserved. One of the things about having children is that whether you like it or not, you become acquainted with some of the television programming aimed at them. One of the shows to which I admit a sneaking fondness is called ‘The Slammer’. Ostensibly set in a prison – hence ‘The Slammer’ – inmates can earn early release by performing in a weekly variety show called ‘The Freedom Show’. In reality, these are of course stage acts, and they are participating in a talent show. The children in the audience choose the winner by the loudness of their applause. Those who do not win are condemned to stay and face mealtimes where they always eat the dreaded ‘sloppy poppy porridge’. 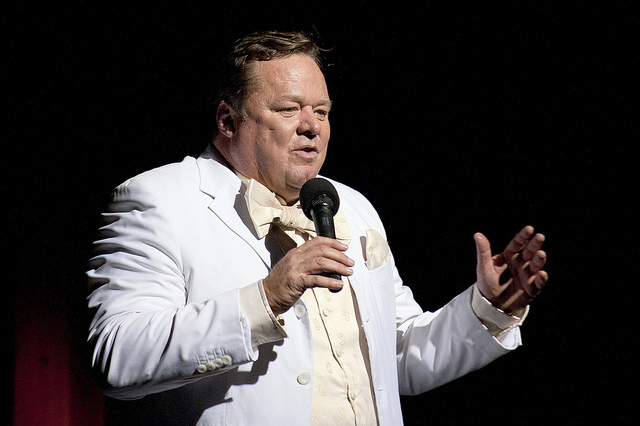 ‘The Freedom Show’ is compèred by the prison governor, who is imaginatively known as ‘The Governor’, played by the comedy actor Ted Robbins. He is assisted a warder called Mr Burgess, who is like a watered-down version of Fulton Mackay’s character Mr Mackay in Ronnie Barker’s comedy series ‘Porridge’. However, the Governor wants to be more than a compère. He hankers to be a performer himself, and makes a big entrance to ‘The Freedom Show’ every week, often dressed garishly in clothes such as a yellow dinner jacket and bow tie. I don’t know why it makes me laugh, but it does. Anyway, “Who’s the Governor?” becomes a suitable catchphrase for this sermon. Who’s the Governor – Herod Agrippa or God? Let me place that in context. Herod Agrippa has just suffered a damaging reverse. Having gained political capital by imprisoning and executing some of the early church leaders, he thought he was onto a winner when he had the apostle Peter put in his ‘slammer’, and scheduled for execution. No long years on Death Row in those days. But Peter had miraculously escaped, and Herod in his temper – having been publicly shown up by the power of God – had the guards executed in a moment of pique. This has come not long after Luke has also recounted in Acts the story of the prophet Agabus foretelling a famine, and the church at Antioch responding by organising a relief collection for the disciples in Judea. So we’re about to see a contrast between the worst of human rulership and the best of God’s kingly rule. As we do this, we shall learn more how to pray and witness today, even in the face of adversity, and more about the true nature of the God we serve. Firstly, compassion. What’s wrong with this picture? What’s wrong is that in the Hebrew Scriptures, a king was to look after the people. To be in dispute over the need for food was not good. To withhold food even from those of another nation was not normal behaviour for a good king. But the people of Tyre and Sidon need to grovel to get what they need from Herod. This is not right. We already know that this Herod was a violent man from his treatment of the church leaders, and perhaps this is no surprise for a man who was the grandson of the so-called Herod the Great, the man who ordered the slaughter of the innocents in Bethlehem, and who might better be called Herod the Terrible. The Herod of our story, Herod Agrippa, had also been educated in Rome, and was a friend of the Emperor Caligula, to whom he owed his power. We don’t know what this unsavoury ruler was going to do about the request from Tyre and Sidon, because he doesn’t get the chance. All we do know is that he had consciously allowed an unjust situation to develop, and there was only any possibility of resolution because one of his officials, Blastus, had taken a chance. This meeting was not by Herod’s initiative. He had shown no interest in the welfare of these people. We know enough about heartless tyrants in the history of the world and in current affairs. Starving a population is a tactic both ancient and modern. From ancient Assyria to modern Syria, this is a common practice. Contrast this with what we have seen in the church not long ago in Acts. The prophet Agabus has appeared on the scene and prophesied a coming famine. But the response of the church is to organise support for those who will suffer the most. It is like a reflex action. Think of Joseph in Genesis storing Egypt’s food in the seven years of plenty before the seven years of famine, and you will see a similar approach. 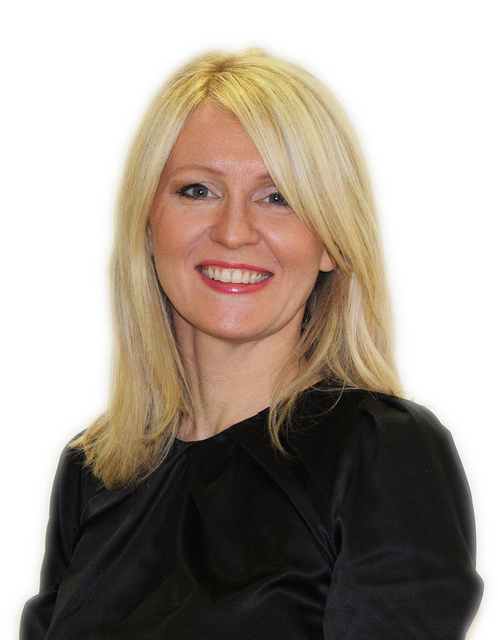 Esther McVey MP by the Department for Work and Pensions on Flickr. Some rights reserved. that the number of sanction referrals made by jobcentre advisers is part of a “variety of performance data” used to monitor their work. Our witness to the God of compassion, who inspired Joseph to feed Egypt, Agabus to warn the early church, and Jesus to feed the multitudes, is needed more than ever today. How will you do it? Buying supplies for the food bank? Supporting a charity? Directly helping someone in need that you meet? It needs doing. Who’s the Governor when it comes to compassion? Elsewhere in Acts, apostles like Paul are wrongly acclaimed as gods by adoring crowds, but they are always quick to deny it. Herod doesn’t. Was it all too appealing to him? He had turned up dressed in all his splendour, and had done everything to impress the need people of Tyre and Sidon with his status and power. It does him no good. Corrie ten Boom on Flickr. Some rights reserved. How might we approach a proper humility, then? There are some behaviours that look like humility, but aren’t. These include the so-called ‘humblebrag’, where we say something great about ourselves, but set it against a self-deprecating comment, yet really we are trying to tell people how wonderful we are. There is the wrong use of the word ‘humbled’ when we actually mean ‘proud’ – for example, “I am so humbled by the number of people who said they liked my sermon last week.” It’s OK to admit to excitement, but let’s not re-label pride as humility. 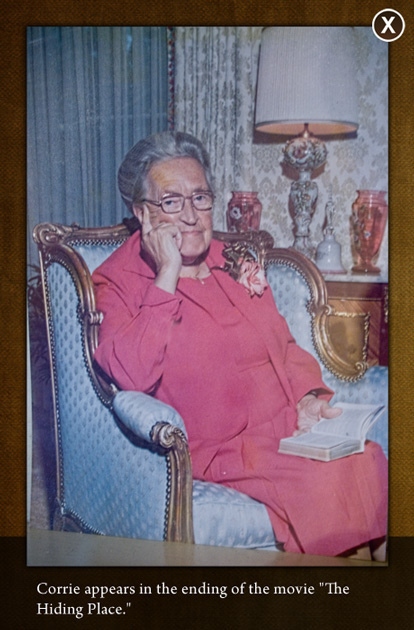 There is the failure to take a compliment when God gave us the gifts – we need to remember Corrie ten Boom’s bouquet of flowers. Or there is the “All the glory goes to the Lord” school of hyper-spiritual sanctimoniousness. Again, Corrie ten Boom had the balance right. Who’s the Governor when it comes to authority? The third and final area of contrast is that of judgement. And immediately, because he had not given the glory to God, an angel of the Lord struck him down, and he was eaten by worms and died. Does this sound unlikely to you – that Herod was struck down, eaten by worms, and died? What if I told you that the Jewish historian Josephus records this incident, too? His account is different from Luke’s, but it is complementary. Where Luke says that Herod didn’t give glory to God, Josephus says he failed to rebuke the impious remark. And where Luke says that an angel struck Herod and he was eaten by worms, Josephus tells us that he was struck by severe stomach pains for five days, and then he died. The one who judged violently and unjustly was himself judged. We know the frustration and horror of looking on while the depraved thrive in power. We can name any number of wicked despots from the present day or the recent past. So too could the biblical authors. They wondered aloud why the wicked prospered, often at the expense of the righteous. They asked why God wasn’t doing anything. And of course we know that Jesus told stories like the parable of the wheat and the tares and the parable of the net which indicated that the separation of the good and the evil would not happen until the last judgement. Yet here we see an example of judgement being executed in this life. So perhaps this is a time to remember that when we are dealing with the kingdom of God, we speak about it as being both ‘now and not yet’. There is a ‘not yet’ about the kingdom of God in that all will come finally and fully under God’s rule at the end of all things, after the last judgement. But we should not lose sight of there also being a ‘now’ element to God’s kingdom, in that we do see some examples of God reigning in kingly power and overthrowing wickedness, sin, and suffering in our own day and time. That seems to be what the early church witnessed when God sent his angel to strike down Herod Agrippa. And there are examples from even the darkest times in recent history. Rees Howells, a Welshman deeply affected by the Welsh Revival of 1904-1905, and the founder of the Bible College of Wales, was deeply affected by spiritual awakenings he witnessed as a missionary in southern Africa. During World War Two he was led by Christ into a deep ministry of intercession, which you can read about in the classic book ‘Rees Howells Intercessor’ by Norman Grubb. While some of the story is a little strange, Howells and his colleagues prayed with passion and vigour throughout the war, sensing particular direction from the Holy Spirit at certain times to pray in particular ways for certain specific outcomes. The book is an astonishing account of how God led and answered their prayers, leading eventually to the downfall of the Axis powers. We can talk about the genius of military leaders, the inspiration of politicians, tragic tactical mistakes, and so on. But there is an obscure yet vital story to be made known about the spiritual dimensions of Hitler’s downfall through intense, committed prayer. Given that, let us not lose hope when we pray for the needs of the world today and every day. We may have to wait, because God’s actions are ‘not yet’, but we never know when he might execute justice ‘now’. So if that is possible, why should we not in prayer ask him to be at work in our time, tipping the thrones of the unjust until they fall from their perches? Remember this question: who’s the Governor when it comes to judgement? And more generally, that should be a question to guide our lives: who’s the Governor? Ben Witherington III, The Acts of the Apostles: A Socio-Rhetorical Commentary, p 383f. A break from the Acts series this week, as I visit a church that generally uses the Lectionary for its sermons. If you want to hear something on Acts of the Apostles, go to Knaphill Methodist’s media page in the next couple of days and you’ll hear the recording of the all age service there in the sermon series. 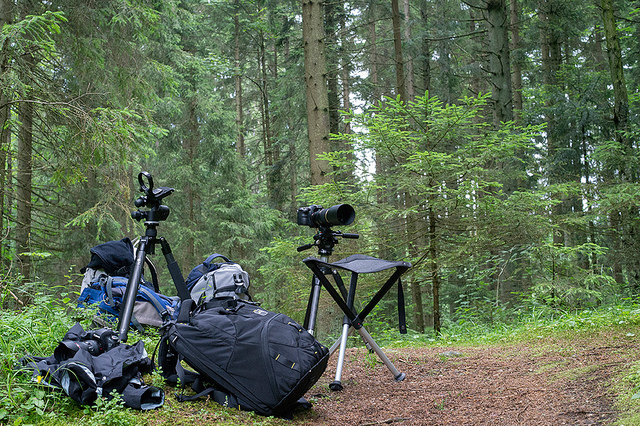 Even Wildlife Photographers Need A Break by zoomyboy.com on Flickr. Some rights reserved. On Wednesday, our daughter left junior school. My wife Debbie and I went to the Leavers’ Assembly at the school that afternoon, which was taken by the entire Year 6 cohort. They didn’t just look back at their favourite memories of junior school life, they also looked forward. Three of the children acted in a series of sketches, imagining themselves sixty years on at a reunion. Some children – including our Rebekah – stood up and told everyone what their ambition was. Becky’s, by the way, is to become a wildlife photographer. Did you have a dream for your life? What happened to it? Did you realise it in full, or perhaps in a modified form? Or did it fall away? And did you have a dream for what you would accomplish through your faith in Jesus Christ? I wonder what has happened to that over the years. Is it still intact? Or did it slip through your fingers? Today, as we come to the end of Matthew 13, the great chapter in this Gospel of parables, we encounter a set of five final parables about God’s dream – his kingdom. Unlike our dreams, God’s dream of the kingdom, which is his ambition for creation, is one that will be fulfilled. Let’s explore these parables in outline with the hope that we might recover our God-dreams for his kingdom. To do this, I’m not going to look at any one parable in detail, but rather pick out the big themes. Between them, the five parables give us three major themes. Yeast by Konstantin Lazorkin on Flickr. Some rights reserved. Firstly, Jesus calls us to dream small. 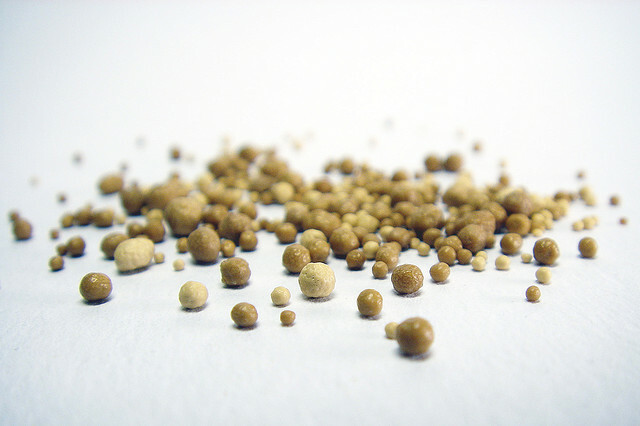 We have the parables of the mustard seed that starts small but grows into a tree (verses 31-32), and the parable of the yeast, a small amount of which leavens three measures of flour (verse 33). Yes, these things end up big, but they start small. And the trouble with many of our dreams is that we want to go big from the start. In fast food terms, it’s as if we want to supersize them. So you can go to some major Christian conferences and leave with a rallying call to ‘take this nation for Jesus’. Or you can hear other Christians talking up massive social justice campaigns. But, says Jesus, the dream of God’s kingdom starts small before it grows. An American Christian called James Davison Hunter has thought deeply about this. He has noticed these big projects of both conservative and liberal Christians to change society. The conservative Christians tend to believe that if we could only launch some mass evangelism efforts and see many people converted, then our culture would change. The liberal Christians identify a social evil and attempt to rally people to that cause, thinking that a political change will improve things. Hunter, though, says that neither strategy works. What we need, he says, is ‘faithful presence’. We need Christians who will be a faithful witness where they already are. This, he argues, will be salt and light in society, and ultimately have more of a chance to bring sustained change to our world. In this light, think back to the video you watched after we heard verses 31 to 33. Jeremy Cowart by Breezy Baldwin on Flickr. Some rights reserved. Jeremy Cowart grew up in a Baptist church in Nashville, Tennessee. He wanted to become a painter, and indeed that is how he started out in his working life. Through painting, he discovered an interest in graphic design, and through that got to learn the famous computer software Photoshop. And through Photoshop, he discovered what would become his true life’s passion – photography. Still living in Nashville, one of the centres of the American music industry, he had several friends who were musicians. Some of them asked him to take the photos for their CD booklets. As some of those bands became more successful, so they recommended their friend Jeremy to their record companies, and this eventually meant he was asked to go to Los Angeles to shoot pictures of musicians. He became very well known among some of the world’s most famous musicians, and through that was also asked to take official photos for television programmes and some of the most famous celebrities on the planet. As a Christian, Cowart wondered what he could do with his fame and influence. He has even been named ‘the most influential photographer on the web’. He realised that photography could bring a sense of dignity to many downtrodden and poor people in the world. Alongside all their known needs for food, shelter, money, housing and other essential things, he knew that many of these people would have their self-esteem vastly improved if they could be given a professional portrait photo. So he started to contact people around the world in his industry: fellow photographers, but also hairstylists and make-up artists. A few years ago, on a December Saturday, they offered their skills to people in various communities. It is now an annual event, with over 20,000 professionals involved each year. They take their expensive cameras and lenses, lighting and backgrounds, make-up and so on to a local centre. They befriend people, take their photos, print them on the spot, and give them free of charge. The photographers pay all the costs, and are encouraged not just to take and give the photo, but to go the extra mile for these people. The lady with the lighter blonde hair was the first to get her photo taken. We asked her if she’d like us to do her hair and use some makeup. She was ecstatic and didn’t know what to say. She sat there with a smile on her face the whole time and was so thankful for someone to care for her. One lady just looked at us, almost in tears, and said “why are you doing this for us?” We explained that it wasn’t because of anything in us, but because of what God has done in us that causes us to love one another and bear each other’s burdens. We ended up giving out our contact information to everyone who attended that day and we’ve had several responses back for prayer, needing help finding a job when you have 2 felonies, and helping finding places to live and get established. We also partnered with Crossway Publishers. They gave us 40 brand new ESV bibles to give away. We signed and gave away 38 bibles. Some people were even coming in and asking for a Bible, but didn’t necessarily want a portrait. We got so many hugs that day! 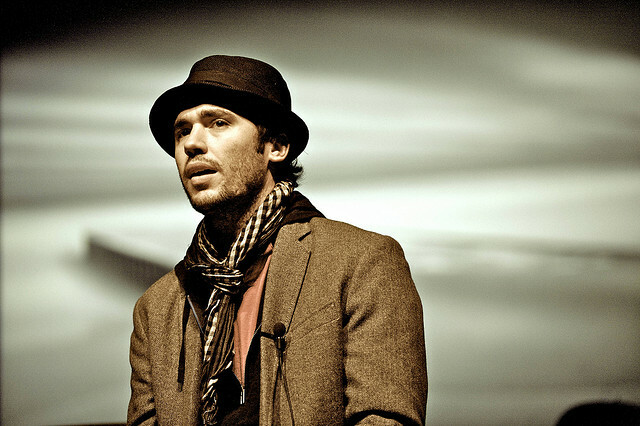 Jeremy Cowart started out anonymous and became world-famous. His idea began small, but now touches thousands every year. This is mustard seed faith. This is the yeast at work. Is there something small you could do for the love of God and the love of others with your talents? Who knows how it might spread and make parts of this world more like God’s kingdom. 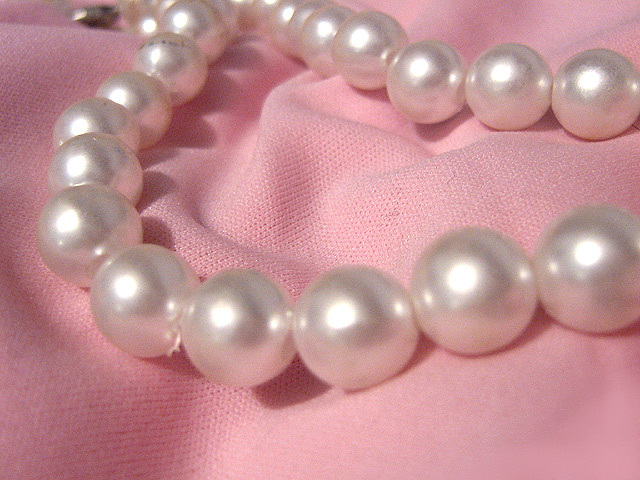 Pearls by Milica Sekulic on Flickr. Some rights reserved. Secondly, having begun by dreaming small we can now dream big. Here we come to the parables of the treasure hidden in a field (verse 44) and the pearl of great price (verses 45-46). No. The offering God wants from us is not ten per cent, but a hundred per cent. The one who discovers the treasure sells all he has to acquire it, and so does the merchant who discovers the supremely valuable pearl. As I once heard it said – and the first part of this at least goes down well in Surrey: God is a capitalist. He only believes in takeover bids. God and his kingdom, with its wonderful vision for how things can be and how things will be, is such a captivating, heart-stirring sight that the only proper response to it is to give our entire selves in the cause. There was a slogan at the recent World Cup Finals which caught the mood of this well: ‘All in or nothing.’ That could summarise what commitment to Christ and his kingdom is about. When we think of what he has done for us – especially on the Cross – how can it be any less? You start by dreaming small, simply aiming to take your gifts and talents and create a faithful presence in the world. But you back it up with a big commitment. You put heart and soul, mind and body behind that small faithful presence. It’s one thing having a dream, but it’s no good sitting around, waiting for it to happen. It takes commitment of the blood, sweat and tears variety to make it come into being. Church is not being run for your benefit or mine. Church is here to give glory to God in worship and in mission, and to train us all up as wholehearted disciples. God is completely devoted to that. The only fitting response on our part is to back our small dreams with big commitment. 07042011130 by Mark Bellingham on Flickr. Some rights reserved. Thirdly and finally, we need to dream long. We come to the parable of the net, in which the good fish from the catch are kept but the bad ones are discarded, as a sign that the separation of the evil and the righteous will happen at the end of the age (verses 47-50). In today’s reading it stands alone, but just as there is a pairing of the mustard seed and the yeast parables, and of the hidden treasure and the pearl of great price parables, so the parable of the net pairs with the story of the wheat and the weeds (tares) that Matthew placed earlier in the chapter, at verses 24 to 30. These two parables encapsulate the long-term dream of God’s kingdom as a place where righteousness is all-pervasive, and evil is conquered. War, chaos, suffering, famine, sickness, and other ugly members of their family are gone, not least because God has banished those who perpetuate wickedness. Somewhere in the heart of our kingdom dreaming is often a desire to obliterate evil now. so when sin rears its head again, or violence wins another day (and we have too many examples of that in the news right now), then we can become discouraged. Why doesn’t God throw away the bad fish now? And if we’re not careful, our deeply committed discipleship turns into an aggressive crusade against others. What’s more, if we dare to look in at ourselves, we too are a disturbing mixture of good and evil. If we need mercy ourselves, how much more should we seek it for others? Patience by Amanda Richards on Flickr. Some rights reserved. So we need patience. God is playing a long game. There will be setbacks along the way, but none of these need deter us. To put it another way, sometimes we treat the Christian life like a hundred metre sprint, but actually it’s a marathon. So we keep plugging away, even when – as marathon runners say – we ‘hit the wall’. The parable of the net (and the parable of the wheat and the weeds) reminds us that it is worth the slog of keeping going in kingdom things. One day people will be receptive and we shall be encouraged, but on other days we won’t. In one of the darkest periods of my life and ministry, there was one Bible verse that just about kept my head above water, even though I didn’t understand what God was doing in the situation. It was the final verse of 1 Corinthians 15, Paul’s great chapter on the Resurrection, where in the light of that great hope he tells his readers, ‘your labour in the Lord is not in vain.’ Nor is ours. And as those who face far worse than we do – such as our persecuted brothers and sisters who have fled Mosul in Iraq in the face of the evil ISIS movement – one day there ‘will be weeping and gnashing of teeth’ for the wicked. I know we get edgy about longing for judgement and that’s reasonable when our desire for God to judge people is really some religious blood lust. But when people are suffering serious premeditated wickedness, as is happening in northern Iraq and other parts of the globe, then this is purely a heartfelt cry for justice, even if it comes within the framework of God’s long game, while he longs for even the most sinful of people to repent and find his mercy. The long dream is one with an awesome climax, and it requires us to dream big in the level of our commitment. But it all starts with the small dream, the faithful presence in the world using our gifts to bless people outside the church now. Will you leave this place this morning to begin – or to re-engage – small, and trust God for what he will do? The language ‘kingdom of God’ is a problem today. Most obviously it’s a problem if you live in a republic. How do you relate to the image? One American Christian writer faced that difficulty and decided to paraphrase it in a way that he thought maintained the impact of the expression. He called it ‘the revolution of God’. And even in a monarchy like the United Kingdom, we have trouble relating to the phrase ‘kingdom of God’. In our nation, the Queen acts on the advice of her ministers. The sovereign’s powers have been circumscribed over history. We, too, need to understand that when John the Baptist comes proclaiming the kingdom of God – the very theme that will be central to the ministry of Jesus – we are talking about a revolution. The revolution of God. Indeed, ‘kingdom of God’ was revolutionary language in New Testament times. And our mission this morning is to consider what kind of revolution John was heralding, and which would arrive in Jesus. Because make no mistake, if our Advent preparations consist merely of tinsel, presents and mince pies we have missed its true meaning. This is the season when we prepare for revolution. And that is essential for us to grasp. We have taken it as a truism for so long that the kingdom Jesus came to preach was not the one that good Jews of his day longed for. That’s a truism because it’s true! But if we Christians aren’t careful, we become smug or complacent about that, and we miss the fact that the kingdom of God is still revolutionary for us. Why? How? 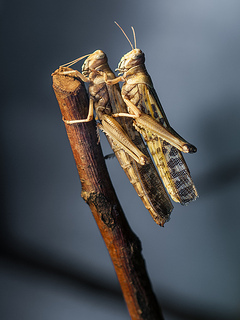 Locusts by William Warby on Flickr. Some rights reserved. Firstly, the revolution of God is an outsider revolution. John is not part of the establishment. No priest or scribe he, even though he was the son of Zechariah who ministered in the Jerusalem Temple. John puts all that behind him and goes to the wilderness. No flowing priestly robes for him, he goes for true shabby chic (without having it professionally distressed) in his choice of camel hair and a leather belt. I have joked in past years that he might have been the inventor of the ‘Bush tucker trial’ on ‘I’m A Celebrity, Get Me Out Of Here’ with his diet of locusts and honey, but actually he wouldn’t have been impressed at all by celebrities. In fact, given the scathing words he addresses to the Pharisees and Sadducees here I can’t see him getting on the phone voting to save them. Here’s the way God’s revolution often works. It comes from the margins, not the centre. It is rare for God to renew his church and reform society in a movement that comes through the structures of power in the church itself. He tends to be at work on the outer boundaries. He tends to be stirring things up among those who do not have access to traditional sources of power or authority. He takes delight in using nobodies. It’s not just the aims of God’s kingdom that are revolutionary, it is the methods, too. And if that is true, then it is time for hope to spring up in the pews of the church. Hope – and perspective. Do not wait around, expecting the ministers and Local Preachers necessarily to be the standard bearers of God’s revolution. I would love to be such a person, but God may not choose me. Do not assume that because of my office God will somehow automatically choose me. That is by no means necessarily God’s way. He may come in power upon and through those of you who think you are nothing in the eyes of the church, let alone the eyes of God. It’s what he did, using John the Baptist in the wilderness. It’s what he did, having his son born in poverty and laid in a manger. So I invite you this Advent to consider the thought that you are as likely as anyone to be the kind of disciple that Jesus would enlist to do something significant in the revolution that we call his kingdom. Do not let the disappointments of everyday life blind you to the possibility that God may choose to use people who are among those who are unexpected, the ones who would never pass the selection criteria for the ministry, the ones who never pass exams, the ones who have never been in the limelight or held a significant rôle in society. 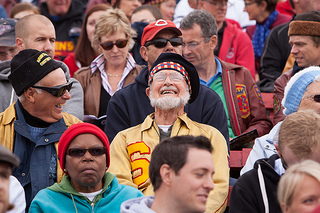 Homecoming 2013 by Queen’s University on Flickr. Some rights reserved. The Lord is coming home, is the message. He is coming to take his rightful place on his throne. That is why we can say the kingdom is coming. And it was relevant to John’s audience. These words are quoted from Isaiah 40, where the prophecies of Israel’s return from exile in Babylon begin. It is no accident that scriptures with that theme were relevant to John and Jesus. For in their day, the Jews believed they were still in exile. Not geographically, for they were in the Promised Land, but because they did not rule it themselves on behalf of God, but living under a foreign power, Rome, they felt they were still effectively in exile. Many felt God had deserted them. Some rabbis had said that after the final prophet in the Old Testament had spoken, the Holy Spirit had left Israel. So imagine what it is like for them to hear that God is making a homecoming. He will reign – and the Romans will not. He will be present in his kingly power, not absent. This is good news. In fact, it really is good news in their terms, because the word ‘gospel’, which we translate as good news, comes from an ancient practice of proclaiming the great things the king had done. God’s return to Judah and especially to Zion is a Jewish form of gospel. Yet now see these things not merely as Jewish gospel two thousand years ago, but in the light of the One who did come to Zion, Jesus the Messiah. He comes to reign. He comes and has the title ‘Lord’. He is Lord, and by implication, Caesar is not Lord. The Romans would not have the final say in this world, and nor will the powers that be today, be they political, military, economic or media. Like Jesus was to say to Pilate, they only have power because it has been granted to them from above. The true Lord of our lives and of the whole cosmos is Jesus himself. So we rejoice that the powers of our day will one day have had their day, while Jesus reigns – not from Zion but from a hill outside where he was lifted up; not in a temple made by human hands but in the midst of a temple made of humans; not in the precincts of Jerusalem but at the Mount of Olives, from where he ascended and where he will appear again. The authorities of today are put in their place. They can posture and pout as much as they like, but it is all vanity and we can laugh at it, because Jesus is the true Lord. We can also resist their seductions, in the name of Jesus the coming Lord. It will anger them, and it will cost us, but their days are numbered. And furthermore, if Jesus is the presence of God coming to us – Emmanuel, God with us, as we remember at this time of year – then we are no longer alone. God has no longer deserted his people. By sheer grace, God is with us. Yes, granted, God hides himself from us for seasons, but he has come to be with us and never to forsake us. 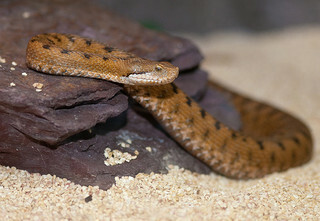 Viper by William Warby on Flickr. Some rights reserved. This is a kingdom where status counts for nothing. All that matters is the opposite of clinging to status: humility; the humility that leads to repentance. A repentance that does more than say sorry; a repentance that makes straight our crooked paths to be fit for the coming of the Lord. This is a kingdom where no-one can rest on religious laurels. What could have been truer for good Jews than to trace their spiritual heritage back to Abraham? Yes, that strictly was where God began to form a pilgrim people for himself, but it could not be claimed as a badge. You could not hold up your ‘child of Abraham’ laminate on your lanyard and automatically be granted entry into God’s kingdom. There had to be substance, and that was shown by a willingness to change. There has to be the substance of repentance for us, too, and it needs to be on-going. John could come to us and say, ‘do not think you can say to yourselves, “We have Wesley as our father’”’ We are not a heritage site designed for spiritual tourists, we are a colony of God’s kingdom. Let us beware what we are building on. In one previous church, a group of people objected to the use of modern worship songs alongside traditional hymns. (Those who enjoyed the contemporary songs were more generous in their attitude to the tried and tested gems from the past.) The final straw for one of this group came after I had left that church, when they decided to replace the pews with chairs. She and her husband resigned their membership. Her understanding of faith was based on the style of her heritage, and certainly not on the spiritual substance of what Wesley wrote about in his hymns. So let us ask ourselves this question: when was the last time we allowed God to challenge our actions, our thoughts, our words or our lifestyles? Have we permitted God to effect a revolution in our own lives, such that he may use as agents of his revolution in the world? There are many popular images of the church. It is common to say that it is a hospital for the sick and the sinners, and I certainly understand the church like that. But I think we also ought to ask what kind of church we are. Would it not also be reasonable to conclude that the church is a field hospital, healing its wounded so that they may be strong for the battle with those forces that foolishly resist the coming revolution? Here God binds up the injured nobodies and sends them to herald his kingdom from the outside, not the centre. Here in the church, his revolutionaries know the presence of Jesus and acknowledge him as Lord, following his instructions in his presence. Have we signed up for the revolution? Because that is what John – and later Jesus – called us to embrace. One of my least favourite, but most necessary, possessions is the alarm clock. Without it, someone like me, who is constitutionally a night owl, would oversleep every morning. I cannot say I appreciate the insistent beeping that says, “Listen to me, I am so annoying. Just get up and switch me off.” While other people bounce out of bed, energised to meet the new day, I wish the god of sleep had not been dethroned for yet another day. The night is nearly over; the day is almost here (verse 12). Advent is the season that tells us God’s time. It tells us not simply that Christ is coming in terms of his birth at Christmas, it tells us that he will one day appear again, this time not in obscurity but in glory. In these terms, we might get nervous about Advent as an alarm clock. The thought that ‘our salvation is nearer now than when we first believed’ makes us think of those Christians who are forever predicting that Jesus will come again very soon. Their predictions always fail, and we are left with the Christian faith being discredited by what is either well-meaning error or cynical emotional blackmail. We want none of that. We know that Jesus said no-one knew when he was coming again. But the basic truth which Paul elucidates here must be true: our salvation is nearer now than when we first believed. The fullness of God’s kingdom is closer. There is less time until the general resurrection of the dead, and God brings in his new heavens and new earth. Telling the Advent time, then, is about living with a sense of urgency. Not frantic, not haunted or hunted, but urgent. The hour has already come for you to wake up from your slumber (verse 11). In a service where we have already baptised Leo, ‘wake up’ may be a theme that provokes certain thoughts and emotions from Kim and Mark! While I hope that at two years old, Leo has long since established a sleep pattern, there are doubtless still plenty of occasions when his parents don’t need an alarm clock, because they are woken by his calling. What does it mean to wake up when we discover the urgency of God’s time? Partly, it is about the urgency of which I spoke a moment ago. When we know that the grains of sand are trickling down through God’s timer, then we know we need to wake up and get on with things. The alarm clock says, if you don’t get on with things now, you’ll be late for work. And you don’t want that. The crying baby says, I have an urgent need. Come to me! What kind of person is ‘awake’, according to Paul? It is one who is prepared for the end of the night and the breaking of the dawn. For Paul, the ‘night’ is the present evil age, the age of sin, which Christ came to conquer and redeem in the Cross. The ‘day’ that is ‘close at hand’ (verse 12) is the kingdom of God, where God reigns in love, justice and grace. If we have heard God’s Advent alarm clock, we want to be living as if it is daylight, not as if it is night. So if I am to be ‘awake’ in the sight of God, I will be a person who embraces the kingdom of God. I will be someone who lives according to the values and principles of God’s coming age, even when they conflict with the darkness of the contemporary ‘night’ in which we find ourselves living. Therefore, to live awake as if in God’s daytime is to live by love for God and for neighbour. To be awake in Christ is to live in a spirit that forswears revenge in favour of forgiveness. To live in the day means to show God’s special concern for the poor and the obscure, instead of the popular fantasies that prefer the wealthy, the powerful and the celebrities. To be awake in the kingdom of God is to live a life based on the fact that the most precious thing in all the world is to know that I am ‘loved with an everlasting love’ by Almighty God in Jesus Christ. I do not then take my significance or status from my job or my social standing: to do so is a vanity, compared with God’s love for me in Christ. To live as awake in the light of Christ is to know that God’s words are a light to my path, not to let the loud but passing fads of our culture steer our lives. Advent, then, is a call to wake up to God’s time: that Jesus who came will come again. It means we need to wake up and live in God’s daylight. I’ve just suggested a few examples of what that will mean for us. Rather, clothe yourselves with the Lord Jesus Christ (verse 14). ‘Put on’; ‘clothe yourselves’. Get dressed. Wear on the one hand ‘the armour of light’ or on the other hand ‘the Lord Jesus Christ’. What are we to take from these images? I believe it’s something to do with the fact that to live according to the daylight of God’s kingdom rather than the night-time of the present age is going to take an effort. We need to be intentional about it – that is, it won’t just happen to us. The old slogan ‘let go and let God’ may be valuable in teaching us to trust God, but if we think we don’t have a responsibility for our actions, we’re tragically mistaken. We need to co-operate with the work of the Holy Spirit in our lives. We shall live by his power, but we need to say ‘yes’ to walking in his ways. We have all the resources of Jesus Christ, but we still need to ‘put him on’ – to be ‘clothed in Christ’. God shines his light, but we still need to ‘put on the armour of light’. And perhaps ‘armour’ is a telling image for the clothing we wear. To wake up and live in God’s daytime is to accept not merely that we will live differently from the world. It is to accept that to do so will mean we need the protection of divine armour, because we shall find ourselves in a conflict, and sometimes under attack for doing so. The trouble with living by daylight is that light starts to shine into darkened places, and the darkness no more welcomes that than a dictatorship embraces dissidents. If we put on the armour of light, we are the dissidents of the world. Think about it in relation to the examples I mentioned a minute or two ago: loving God and loving neighbour sounds attractive – after all Girl Guides promise to love God and do good – but while society will accept this up to a point, what our culture really wants to believe is that charity begins at home. In other words, we put ourselves first. Forgiving those who wrong us may get some admiring coverage for a while, but ultimately it’s a challenge to those who always need to find a scapegoat to blame for everything. Finding our status in the love of God rather than in our job or our social standing turns our society’s way of putting people in their place upside down. Favouring the poor and the marginalised may win you certain plaudits, but in the long run our economy can’t run that way, because it’s structured to thrive as much by our purchasing the things we don’t need as anything else. It requires determination, then, to wake up and get dressed in the light of God’s time. Right now, Paul places us at the end of the night, as dawn is coming. Night is fleeing, the day is on its way. But his image breaks down, because he is imagining not a sequence where day follows night but a clash between night and day. If we live in God’s coming daylight, we shall be drawn into that conflict until the time of God’s final and ultimate triumph over the night. Sometimes, the forces of the night will inflict suffering on the armies of the day. That is to be expected for a community that was formed around the sinless Son of God who was crucified on false charges. Friends, as the Advent alarm clock rings and we wake up, determined to get dressed and live in the light of God’s coming day regardless of the temporary presence of the remaining night, we do so knowing the future God has for us. Whatever the darkness does to us now, the Advent hope is not merely that the light of Christ comes into the world. It is that it will prevail. Whatever the evidence looks like at times, when we commit our lives to following Jesus, we sign up with the winning side. Perhaps you know the old story of the vicar who visited a primary school where they were learning the Creed. The children lined up for the vicar and one by one recited a section. However, an embarrassing silence enveloped proceedings part-way through. Is there sometimes an embarrassing silence about the Holy Spirit in our churches? That can be true in some traditional churches. Well has it been said that Catholics believe in Father, Son and Holy Mother, whereas Protestants believe in Father, Son and Holy Bible. The reasons for embarrassed silence aren’t hard to find. Often, they can be put down to one word. Fear. The Holy Spirit? Or worse, the old name ‘the Holy Ghost’. It sounds spooky, if not frightening. On top of that, you get stories like this one in Acts 2 with the account of people speaking in tongues. In some circles, I have only to mention that and people get upset with me! As a result, we either ignore or domesticate the Holy Spirit. When we domesticate the Spirit, we reduce his work to a bland coating of the mundane. It’s like cooking without spices or herbs. What a tragedy. For Pentecost is one of the key events in God’s story of salvation, along with creation, the Incarnation and Easter. And while today I don’t have time to explore the particular anxieties many have around the specific issue of speaking in tongues, what I want to do in this sermon is explore the purposes of Pentecost. Here’s the first purpose: Pentecost makes us more like Jesus. Let me give you some background in order to explain that. If you know your Bibles, you will know that Luke’s Gospel and the Acts of the Apostles are both written by the same author (whom I take to be Luke himself) to the same recipient (a character otherwise unknown to us called Theophilus). Luke’s Gospel describes what Jesus began to do and teach; by implication, Acts is then Part Two of his story. In Acts, Jesus is still at work, but by the Holy Spirit through the Church. In particular, there are parallels between some of the early episodes in Luke’s Gospel and those near the beginning of Acts. Both contain a promise that disciples will be ‘baptised with the Holy Spirit’. Then the Spirit comes down – upon Jesus at his baptism and upon the disciples at Pentecost. After that, there is a key sermon that explains what God is fulfilling – Jesus preaches at Nazareth, Peter preaches in Jerusalem after the Pentecostal outpouring. Then there is witness to people nearby. Put that together, and what is Luke telling us? He’s showing the early disciples going through the same process as Jesus. Pentecost begins their empowered public ministry just as the baptism did for Jesus. By drawing these parallels, Luke is telling Theophilus – and us – that the Holy Spirit has come in order to make us ‘little Jesuses’. The Spirit has come to make our lives and ministries much more like that of Jesus. How often is it we lament that our lives are nothing like Jesus at all? Quite frequently, I’d guess. As Christians, we want to be more like him, but much of the time we know how vast the distance is between the way we live and how he did on earth. What failing or weakness do we lament in our Christian lives? Is it that, unlike Jesus, we struggle to display selfless, sacrificial love? The Holy Spirit is here to move us closer to the example of our Saviour. Is it that we have no assurance that our prayers are heard and answered? The Holy Spirit comes to move us in the right direction. Do we lack courage to share the love of God with others through our words and deeds? Again, the Holy Spirit comes upon us to remake us more in the image of Christ. Let me put it another way, in order to underline this point. Many Jewish people celebrated Pentecost, the Feast of Weeks, as a commemoration of when God gave his people the Law at Mount Sinai. God gave the Law after he had delivered his people from Egypt. It set out the ways they were to please him in gratitude for that deliverance. We too seek to please God out of gratitude for our deliverance (not from Egypt but from our sins). The Pentecostal gift of the Spirit is what enables us to please God. God has shown us the ways we might please him, but he has also given us his Spirit so we may have the power to do what delights him. The second purpose is this: Pentecost is a taste of God’s kingdom. Let me introduce this thought with an illustration. Every now and again, we go into Chelmsford town centre on a Saturday as a family for various reasons. There is one stall among all the market stalls where we are almost guaranteed to stop every time. That is the fruit and vegetable stall. Apart from the fact that we enjoy buying some of their delicious fruit, they have samples available on a table by the stall. Usually they have cut up oranges and pineapples in the hope that passers-by will try some and then say, “Wow! I must buy some!” Regardless of whether we are going to buy any, our seven-year-old daughter Rebekah stops off for a little feast. In her eyes, the fruit samples are there purely as a public service. Pentecost is like the opportunity to sample a taste of some fruit, too. The Jewish Feast of Weeks was a harvest festival. Not a full harvest festival like that celebrated at the end of the summer when all the crops have been brought in, but a festival of first fruits. When the first crops came in during late Spring, the people got a taste of what was to come three months or so later. Pentecost, then, becomes the taste of what the fullness of God’s kingdom will be like, when God sends his angels to bring in the great harvest of the ages. Just as the Resurrection of Jesus is also described as the first fruits (of the great resurrection of all) and anticipates the day when God will make all things new, so too the gift of the Holy Spirit brings a foretaste of the new creation, when God will renew the heavens and the earth. Every sign of the Spirit’s work now, whether large or small, quiet or loud, private or public, is a taste of God’s fruit stall. So when the Holy Spirit inspires us to care for the stranger, we taste God’s future. When the Spirit calls someone from the darkness of sin to the light of Jesus Christ, our taste buds anticipate the flavours of the kingdom. When the same Spirit does a work of healing in a life (be that physical, emotional, social or any other kind of healing), we glimpse the glorious future where there will be no more pain. When the Spirit leads God’s people to confront evil powers with a prophetic word of truth and justice, we taste the new society to come. When the Holy Spirit does his supreme work of revealing Jesus to people, we get a flavour of that time when we shall no longer know in part, but see him face to face. Yes, it is frustrating and painful that not everyone is healed, not everyone responds to the call to follow Christ, and that powerful forces dish out injustice. We long for the great harvest of love, healing, righteousness and justice. But right now we are in the era of the first fruits. God calls us to welcome his Holy Spirit and co-operate with him, so that there may in the meantime be many more foretastes of his kingdom when he will rule unchallenged. The third purpose I want to highlight is that Pentecost is about mission. Even though I take it not that the disciples spoke to the crowd in ‘other tongues’ but rather that the crowd overheard, what is clear is that the Holy Spirit crosses national and cultural boundaries so that people hear the praises of God in their own languages. In other words, this is a group of people who could speak a common language together anyway, despite their different nationalities. They could understand Hebrew, the language of their faith. Why not just address them in Hebrew? But the Holy Spirit takes the Gospel to them in the language of each of their cultures. They do not have to work within the language and culture of the established religion in order to hear the Good News. For me, this is a vital approach in mission. One of the problems we have in church life is that we want to draw people into the community of faith, but we expect them to adapt to our ways of doing things and learn our jargon. We add unnecessary barriers to the acceptance of the Gospel. This is not what the Holy Spirit does. Think about the ministry of Jesus himself in the Incarnation. He did not stand at a distance and expect people to come to him. Rather , he took on human flesh and dwelt in the midst of the people to whom he was sent. The Holy Spirit mirrors Jesus. He desires to take the Gospel to people where they are in a form they can understand. That becomes the challenge for us. When we are filled with the Spirit, we shall not simply want to make more people who are Methodist or United Reformed like us. We shall want to establish new communities within the many cultures of our world, our nation, and even of our locality. That’s why ‘Fresh Expressions’ and all sorts of experiments in sharing the Gospel in culturally appropriate ways are at heart Spirit-led approaches to mission. We should expect this. When Jesus told his followers they would be baptised with the Holy Spirit, he said the consequence would be that they would be his witnesses. The Holy Spirit is the Spirit of mission. The disciples were to be witnesses ‘in Jerusalem, in Judea and all Samaria, and to the ends of the earth’. Again, the work of the Spirit is not in creating a church that waits for people to come to her on her terms. The Spirit makes us missional people who move out of our comfort zones into the places where those who need the love of God are comfortable. By the power of the Holy Spirit, we share the love of God in Christ in other people’s comfort zones, not our own. This is what Spirit-led people do. In conclusion, then, we have every reason to welcome the Holy Spirit rather than fear him. Who wants to be more like Jesus? Let us welcome the Holy Spirit. Who is hungry for a taste of God’s coming kingdom? Let us invite the Holy Spirit to come. And who wants to share the love of Christ in word and deed in a needy world? The Holy Spirit is already at work, within us and going ahead of us. Let us seek more of his power. See Ben Witherington III, The Acts of the Apostles: A Socio-Rhetorical Commentary, p128f. Although we’re not absolutely certain this was the case at this time – see Witherington, p131. Have you given up anything for Lent? Some of my friends have denied themselves the usual chocolate. Another has started an annual practice of giving up Facebook. But if you had asked this of my wife some years ago, she would have given you a strange look. She came to faith and had her early Christian formation in a Baptist church. When she met me, she found the practices of the Methodist Church strange. I must admit that as someone who has been in Methodism since the womb, I still find it strange! And one practice Debbie had never encountered before was Lent. The day she asked me what Lent was, I couldn’t believe I was hearing what she said. Surely everybody knew what Lent was? It’s been part of my background all my life! Indeed, except for when Easter Day occurs on the very latest day in the year that it can, my birthday always falls within Lent. Thankfully, I’m allowed to feast on my birthday – according to my rules, anyway! Now the reading from Philippians seems a good one for Lent. Not that the earliest Christians practised it, but it is a passage that explores the importance of self-discipline. Now while Debbie’s home church was lower than low – calling baptism and Holy Communion ordinances, not sacraments – I’m sure they too would have endorsed the importance of self-discipline in the Christian life. And at Lent or any other time, that is a critical part of our discipleship. It’s also – as we shall see – an area where we can be a counter-cultural witness in our world today. Implicit in Paul’s teaching here are various core Christian reasons which provide the foundations for living a life of self-discipline to the glory of God. It’s those beliefs I want to explore today. We begin at the Cross. Christians always have to begin at the Cross, and Paul does so here. Paul sees that a root cause of self-indulgence is not taking the Cross seriously. The Cross is not merely the place where I am forgiven – so that I can keep living however I like and then return for the next batch of forgiveness. The Cross is the model for our discipleship. What Paul teaches here is consistent with Jesus telling aspiring disciples to deny themselves, take up the Cross and follow him. Christianity, then, is less about what I can get and more about what I can give. So much of our conversation, even in the Church, is peppered with the assumptions of consumerism. Does this church suit me? Did the worship feed me? Does it have what I need? It’s very me-centred. But the Cross says we have to take a different approach. And disciplines of self-denial and self-discipline are those which call us back to the Cross. They are not preventing ourselves becoming fat, they are about tuning ourselves into the wavelength of the Cross. Lent is supposed to be concerned with spiritual discipline and self-denial, not a handy way of losing a bit of weight. If the new low-fat chocolate tastes as good as an old-fashioned one but doesn’t pile on the pounds, then where’s the self-denial? So we approach Lenten disciplines of self-denial not as some kind of belated New Year’s Resolution to get ourselves in shape; we embrace them as a sign that we accept the Cross will shape the way we live. Their end is destruction; their god is the belly; and their glory is in their shame; their minds are set on earthly things. ‘Their god is their belly.’ Who do we worship when we are self-indulgent? Ourselves. This comment of Paul’s tests what we truly believe worship to be, because it’s a question of allegiance. Does my stomach deserve my ultimate allegiance? I need to feed it, but when it becomes my god, something has gone badly wrong. This, then, is about how we understand worship. Much as I enjoy worship with a band, featuring a lot of contemporary songs, and other people love their hymns, how dangerous it is when we end up worshipping worship. And we forget what worship is. The main New Testament word translated ‘worship’ means ‘to move towards and kiss’. However, the ‘kiss’ envisaged is the ‘kiss of homage’, like that offered to a monarch, and even still kept in a symbolic and ceremonial way in our society when a new Prime Minister or bishop is appointed. They have to go to ‘the Palace’ to ‘kiss the hands’ of the sovereign. Worship is not in the first place about the good feelings and the positive experiences. It is about declaring our allegiance to Jesus Christ, the King of Kings and Lord or Lords. When we deny ourselves as a spiritual discipline, we do so not to torment ourselves but to affirm that God’s will comes first in our lives. We are to indulge his will, not our appetites. We ‘do not live by bread alone, but by every word that proceeds from the mouth of God’, and so our worship is seen by taking God’s word seriously and putting it into practice as a priority. When we do that, our god is not our belly. Instead, we give ourselves in devotion and worship to the God and Father of our Lord Jesus Christ. As we come to our third and final foundation, you could say this is a question of past, present and future. 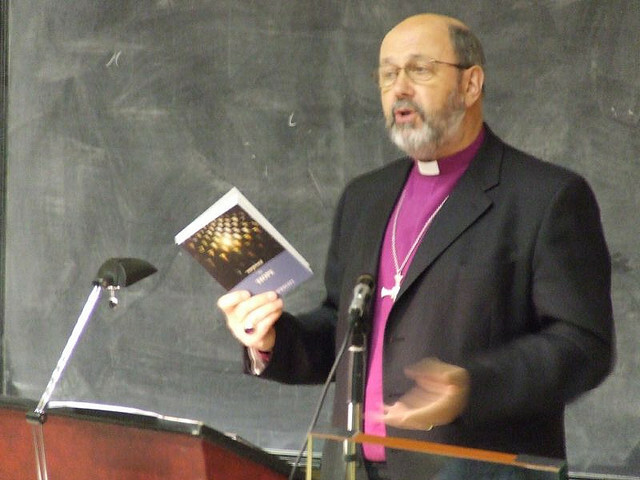 A past event – the Cross – shapes our behaviour now. Our present activity – of worship – needs to be rightly directed to God. So thirdly and finally, that leaves a future component – the kingdom of God. Jesus is coming, says Paul, and our minds are set on him rather than ‘earthly things’ (the worship point again). But Paul goes further: what Jesus will do when he comes also leads us to consider our behaviour now. When Paul says, ‘He will transform the body of our humiliation that it may be conformed to the body of his glory’, he is making a reference to the Resurrection. Jesus’ own ‘body of humiliation’ was transformed into a ‘body of glory’ in the Resurrection. You will remember that the risen Jesus was identifiably the same man who had been crucified (once the disciples’ eyes had been opened), but his body was also somehow different (remember how he appeared in their midst in a locked room, and how he disappeared from sight after the meal at the end of the Emmaus Road journey). So, says Paul, we are in for transformation, too. When Jesus comes again and renews heaven and earth, he will raise us up and renew our bodies, just as his was. This will be an expression of his reign in his kingdom, for he will do it ‘by the power that also enables him to make all things subject to himself’ (verse 21b). If you’ve followed me thus far, one thing you will understand is that our bodies matter to God. They are important to him. The great future of God’s kingdom is a physical one. The idea often trumpeted that our body is just a shell and that the real person is the invisible soul simply doesn’t match the New Testament’s teaching. Our bodies are part of God’s good creation. Yes, they are imperfect and they decay (what Paul calls here the ‘body of humiliation’) but God does not intend to discard them, he will renew them at the resurrection of the dead. What does all this have to do with our Lent theme of self-denial? For one thing, it reminds us that self-denial is not about self-hatred. It is about self-discipline, and that’s a whole lot different. When we deny ourselves, we are not doing so in order to torture ourselves, like Filipino Christians being nailed to crosses as acts of devotion. It is more that we are training our body for better use in the service of God. It is why in 1 Corinthians 9 Paul uses the image of an athlete training to compete in the ancient Olympics. So too our self-denial is an act of training: we are getting ready for the Great Games themselves in the Kingdom of God. In other words, self-denial is a positive action. It is about love for God and his ways. It is part of building for God’s kingdom. In fact, it is something we practise in other areas of life. I remember one particular aspect of our marriage preparation. We sat in the lounge of the manse where the minister friend who was to marry us lived. I recall how awkward he felt about having to ask some of the standard questions to two people he knew. I was one of his circuit colleagues! Well, as someone who has put on a stone in weight since marriage, it may well be I haven’t honoured that as well as I should have done! But perhaps the point stands. And perhaps it helps us see that while we naturally accept we would deny ourselves for our loved ones, how much more we might do so for the love of our God? In conclusion, I can’t tell anyone whether they should give up anything for Lent and if so, what. But I can invite us all to examine ourselves and ask, is my life being conformed to the Cross or are there areas where I need to deny myself in order to make that more true? I can invite us to look at who or what we worship, to see whether our priorities need correcting by self-denial. And I can put before us all the hope of resurrection to enquire whether we need to deny ourselves out of love for God and his ways, by building for his kingdom. Many of us think of Francis Bacon’s famous words when we read this account of Jesus before Pilate. But we have a problem: the Lectionary omits verse 38 where Pilate says, ‘What is truth?’ for reasons that are beyond me. Well, unless it is to do with the political correctness that afflicts the Lectionary in some places. Maybe Pilate has to be rehabilitated. And hence Jane’s piece at the beginning of the service with the cake! If today were just about cake, we’d have few problems with it – maybe it would be suitable for Back To Church Sunday! But the kingship of Jesus is a problem. It’s a problem throughout the Gospels, and it’s a particular problem here. The kingship of Jesus is a problem for everyone who encounters him. By considering how King Jesus is a problem for different people, we shall see how his kingship challenges us all. Firstly, and obviously, King Jesus is a problem for Pilate. To return to Francis Bacon’s words, I don’t think he is ‘jesting Pilate’ at all. Pontius Pilate has a serious political problem here. As a Roman Governor, he is used to being able to throw his weight around, using the occupying army to subdue the locals. His trouble is that he has done it too heavily-handed once too often, having desecrated the Jerusalem Temple. The Jewish leaders had sent a deputation to Rome to protest, with the result that Pilate was on a final warning. However aggressive the Roman Empire was, they saw no need to cause what they believed to be unnecessary provocation in the lands they conquered. Some people seize on this as a sign that obeying the kingship of Jesus means we don’t get involved in politics. They quote it as ‘My kingdom is not of this world’. Therefore, they argue, since we are part of that kingdom, we should not get embroiled in dirty, everyday politics: that’s a different kingdom. But what Jesus says is perhaps better rendered, ‘My kingship is not from this world’. He’s not advocating withdrawal from the world, he’s saying that he does things differently. His kingship comes from heaven, where justice is not established by force or violence. His kingship is therefore radically different from the tactics employed by Roman Emperors or Jewish Zealots. Jesus doesn’t bail out of politics: it is about the common good, and he cares about that. But his kingship redraws how his disciples will get involved. They will do so peaceably, not forcefully. What does that mean for us? Not all of us are directly involved in politics. Apart from anything else, I believe it means that if we live under the reign of King Jesus, we conduct ourselves in public in a peaceable way. We do not shout, scream, demand, manipulate and scheme. We speak up more for the poor and the voiceless than for ourselves. We do so passionately, but without aggression. Is that possible? Jesus managed it. Secondly, King Jesus is a problem for the Jewish leaders. There’s a lot of reference in John’s Gospel to ‘the Jews’. Tragically, down the centuries some Christians (and others, such as Hitler) have used it to justify prejudice and violence against Jewish people. However, John does not use ‘the Jews’ to mean the entire Jewish race at the time. He normally uses it to refer to a distinct group, and he is clearly aware of other people in the story – not least Jesus – who are also Jewish but are not included under ‘the Jews’. Mostly, it stands for the religious authorities who are in opposition to Jesus and his ministry. It is these people, designated ‘the Jews’, who have handed Jesus over to Pilate (verse 32). What’s their problem? Simple. Jesus doesn’t fit their expectations. Jesus is at odds with most of the major groupings in the Judaism of his time. He won’t cosy up to the Roman authorities like the wealthy Sadducees and some of the priestly classes. He won’t use the Scriptures as a weapon to exclude people in the way the scribes and Pharisees do. He won’t retreat to a secluded, pure community like the Essenes. And as we’ve already noted, he rejects the violent revolution of the Zealots. He just doesn’t fit. So what are you going to do with a misfit who keeps causing you trouble? You’ll try to get rid of him. The traditional Jewish punishment of stoning was still sometimes spontaneously used, as we see from the story of the woman caught in adultery . But around AD 30, Rome took away the Jewish right to execute someone. But it further suited the purposes of the religious establishment to have Jesus crucified, because then by being hung on a tree he would be subject to a curse, according to Deuteronomy. It’s sobering what lengths human beings will go to in order to exclude someone they regard as a misfit. Jesus came to earth and disappointed a lot of people. When you follow Jesus, he will disappoint you. The religious leaders of Jesus’ day were quickly disappointed by him. He won’t conform, and life with him will not always go the way we want it to. For he is king, and it is his rule that matters. The question therefore comes, what will we do with our disappointment? Will we attempt to banish or exclude him, like the Jewish establishment of two thousand years ago? Or will we continue to follow him, mixing joy and disappointment? It’s a hard choice, but let’s remember that only those who continued with Jesus through disappointment got to see him in his risen glory. Thirdly, King Jesus is a problem for us today. It’s simply this: even if Jesus radically reinterpets kingship into a peaceful form, it’s still a reworking based on a notion of kingship that has very little equivalent in our world today. We may still have a monarchy, but our Queen is meant to act on the advice of her ministers. Largely, therefore, she gives Royal Assent to Bills in Parliament that have been shaped by politicians. She retains certain powers, but they are much diminished. She is no absolute monarch. Long gone are the days when we spoke about ‘the divine right of kings’. And in other cultures, the gap is even greater. How do you think about King Jesus when you live in a republic with a President as head of state? The American Christian author and speaker Brian McLaren has spoken of his cultural struggle with the biblical references to kingship and the kingdom of God. He suggests an alternative. We should refer to ‘the revolution of God’. I think that’s helpful! If following King Jesus joins us up to the revolution of God, then one thing is certain: we are not in for a quiet, cosy time, at least not in the way some church communities seem to envisage. We are called instead to a dynamic, challenging, risky way of life. A risk-free existence can look very attractive for a while. Although the fine line between risk-free and unbearably boring is easily crossed. But those who want risk-free should never become Christians. To follow Jesus means risking all to follow him. I was recently reminded that the Church of Scotland report ‘Church Without Walls’ says that the essence of church is ‘People with Jesus at the centre, travelling wherever Jesus takes us.’ The whole fresh expressions initiative is about allowing Jesus to take us to those whom our existing churches do not reach, and working with him, as he forms a new group of people, who are willing to go wherever he takes them. That inevitably involves risk. Nothing else is the way of truth. Richard Burridge, John (The People’s Bible Commentary), p215. British listeners can hear this on BBC Radio 7. It has famously been said that women can’t read maps and men won’t ask for directions. Which means that if men are from Mars and women are from Venus, we’re all going to have trouble getting home! Maps and directions: geography. I don’t know whether the word ‘geography’ brings bad memories back to you, in the way that ‘Maths’ or ‘PE’ do to some. I was OK at Geography, and got my O-Level, but I never really shone at it. Sadly, most of what I remember from school Geography lessons consists of the cruel tricks played by pupils on our teacher, who was blind. On the other hand, Mark [our four-year-old] is already fascinated. He writes his own little books at home, which are full of references to the River Nile, the longest river in the world. I think I just need a sat-nav! So why am I wittering on about Geography? Because it is important in the Gospels, and it has a particular rôle to play in this story. I’m going to use some geographical features of the reading to structure these thoughts. I think they’ll show this story has a slightly different meaning from the one we often take it to mean. ‘Let us go across to the other side,’ says Jesus (verse 35). Where is the other side? At this point, Jesus and his followers are on the western side of Lake Galilee, among villages where the people are good faithful Jews. ‘The other side’ is very different. You can get an idea if you know where Jesus and the disciples land in the story that immediately follows this one. They encounter the Gerasene demoniac, who lives among people who are pig farmers. Not exactly kosher Jews! Not only is the demoniac unclean, so are the general population. This whole area to the east of Galilee was one where Jewish people generally mixed and compromised their faith with alien influences from Greek culture. And Jesus says the same to his twenty-first century friends. We too cannot stay just among the people we are comfortable with, because they are like us. We cannot spend all our time in church activities. If we are the community formed by God’s kingdom, then we have to leave our familiar places and go to our ‘other side’, wherever that may be. Insulation is not guaranteed in the life of faith. Jesus calls us, then, not to spend every second of our lives on church matters. He calls us to mix with people not like us at all, with the intention of sharing God’s love in word and deed. They may not dress like us. They may have strange haircuts. They may hold beliefs we find dreadful. Their moral and ethical values may be far from ours, perhaps quite contrary. But Jesus died for each and every one of these people. We cannot stay in a church castle, protected by a moat and with the drawbridge up. For Debbie and me, while we enjoy the company of those we mix with in the children’s primary school community, and while the great majority of the parents care deeply for their children and want only the best for them and others, we are also aware at other times that our values and beliefs are very different. We only know of one other Christian family represented in Rebekah’s class, and to date we know of none in Mark’s. But that’s good: it means we are in a missional context! It means we mix with people who don’t share our values about sexuality, with mothers whose children are all by different fathers. It means having to do with people who are heavily involved with questionable New Age and occult practices. So while we share some things in common as fellow parents, obviously there are certain things that mark us out as different and leave us decidedly uneasy about the lifestyles of these friends. Yet this is our ‘other side’ at times. It is where God has led us and placed us as ‘the church dispersed’. I believe each of us needs to know the ‘other side’ to which we are called. If we know our ‘other side’, all well and good. If not, then we need to listen, because Jesus is calling us into the boat with him and taking us somewhere beyond our usual boundaries on mission with him. The Sea of Galilee, surrounded by high mountains, is like a basin. Sudden violent storms on the sea are well known. Violent winds from the southwest enter the basin from the southern cleft and create a situation in which storm and calm succeed one another rapidly. 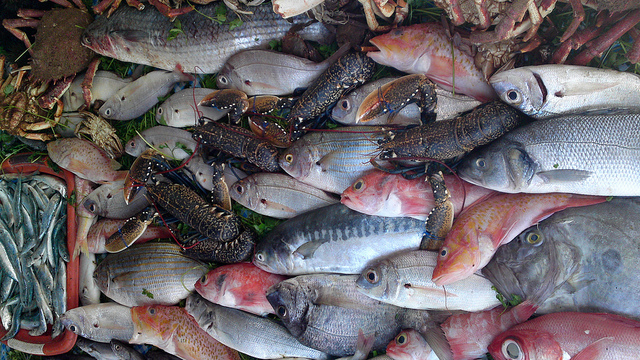 Since the wind is nearly always stronger in the afternoon than in the morning or evening, fishing was done at night. But when a storm arises in the evening, it is all the more dangerous. The storm was a natural, unsurprising event, yet a terrifying and life-threatening one. So it is that when we head for our ‘other side’ storms will blow up against us. The other day I was talking to a minister friend in another denomination. He said he had been at his church eight years, and was dedicated to seeing it transformed from a private religious club to a missionary agency. But he said that process was a painful one. Some people just didn’t want to be thrust out of their comfort zones and stirred up opposition. Similarly, it’s not surprising when the Church moves into the public arena, that atheists and secularists complain, especially if we happen to be moving onto some of their cherished territory. They say that religion should be kept as a private matter. Some even try to use laws against Christians. Some Christians believe we’re seeing signs of that in some legislation in our nation today. 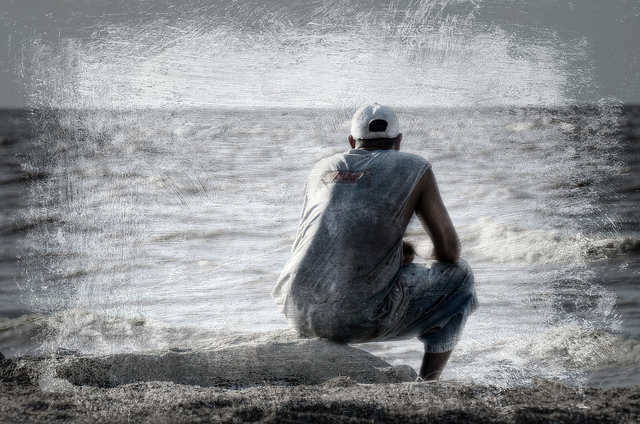 Does rebuking the wind and telling the sea to be still sound familiar? Jesus is addressing this storm, this natural event, as if it were demonic. Rebukes and commands to be quiet are the language he used when expelling demons. We should not be surprised if storms whip up in our lives, often consisting of natural but frightening events, when we decide to cross with Jesus to our ‘other side’ and engage in mission. We are joining battle against an enemy when we do so. He will not take it lying down. He will use church people, non-Christians and social events in attempts to discourage and intimidate us. To paraphrase the late John Wimber, our boat is not a cruise liner; it is a battleship. We can expect storms of opposition. But we must not cower in their face. The storm is a natural event, as I said, but the language Jesus uses to still it (the stilling of such storms also being known as natural events in those days) suggests this natural event has been whipped up by demonic forces opposed to his mission with the disciples to a region of compromised allegiance to God. Jesus stills such a storm. He commands it to be calm. Jesus acts with the cosmic authority that is his. This is a kingdom of God action. He brings the storm under the reign and purposes of God. The kingdom is at work here, not simply to make the disciples’ lives easier, but so that the kingdom may advance when Jesus and the disciples land on ‘the other side’. sleeping in the stern upon the pillow that was customarily kept under the coxswain’s seat for those who were not involved in the actual sailing or fishing. In other words, Jesus commands the storm to be calm as he himself is calm. He brings the storm into line with his own person and character. That is what it means to bring something or someone under the kingdom of God. Jesus brings people and circumstances into his orbit, influence and likeness. As the calm Jesus makes the storm calm, so he seeks calm in his disciples. Prior to this incident they have sat as privileged insiders with Jesus. He has told parable after parable, leaving them as enigmatic stories for the crowds, but he has explained them to this inner circle. Yet they still don’t get it. ‘Who then is this, that even the wind and the sea obey him?’ they ask in verse 41. And as Jesus sovereignly deals with the storms that oppose our early sorties into mission, so he commands calm in our lives. For he calls us to understand more of who he is in the face of the forces arrayed against us, and thus trust him. My problem is I’m all to like those first disciples. In a difficult situation, faith tells me Jesus is in control and reason tells me my worst fears won’t materialise. But my body doesn’t listen. My pulse and blood pressure increase. I end up getting value for money from the National Health Service. Like those earliest followers, I am on a long journey to the calm Jesus wants me to have. Maybe it’s not enough simply to have accepted intellectually that God is in control of events. I need to feed my mind with that truth. I need to meditate upon it. I need to share with other people of faith. In short, I need to ensure I am on a journey of increasing faith. Jesus is calling me – and all of us – over to another side where we shall be his witnesses. Getting there will mean negotiating the storms of opposition, and for that we would do well to have the serenity that comes from trusting that Christ is ruling over all that happens, whether good or bad. One of the early Christian symbols for the Church was a boat. You can see ancient drawings where the Church is represented as a boat. That idea is taken from this passage. When the Early Church set out on her task of Christian witness, she frequently encountered the storms of persecution for her faith. But they knew Jesus was asleep in the stern with them, and all would be under his sovereign care. And perhaps you see now why I said at the beginning that we might end up with a slightly different application of this story from normal. We have often taken this story as an example of how Jesus will calm all sorts of storms in our lives, and I don’t want to deny he does that. Yet the primary application in the passage seems to be connected with mission. Jesus has a specific interest in conquering the fierce opposition to his church’s engagement with mission, and in calming his followers through a growing faith. Knowing that, are we ready to venture across to our ‘other side’? William L Lane, The Gospel Of Mark, p 175.